We are unable to process international orders via this website. Nailtiques Nail Moisturizer is a greaseless fortified conditioning nail crème enriched with soluble collagen, jojoba and aloe. Use several times a week under the nail tips. Apply at bedtime when the crème is least likely to be washed off. Begin using as soon as nail tips become firm. Healthy nails are not only strong, but flexible. BEAUTY SECRET: After removing nail protein, wash hands and apply the Nail Moisturizer directly on the nail surface. Allow the crème to remain overnight. If getting weekly manicures, do this the night prior. Nailtiques Cuticle & Skin Gel is a thick, concentrated glycerin and aloe enriched formula for cuticles, rough skin, dry elbows and knees. Apply sparingly and regularly to dry areas of the skin and cuticles. BEAUTY SECRET: At bedtime, apply the Cuticle & Skin Gel and put on a pair of cotton gloves. On rough, cracked feet, apply crème and put on a pair of socks. Nailtiques Hand Conditioner combines aloe and jojoba oils for a crème that can be used on the hand and cuticle area. Apply a small amount to hands, pushing back the cuticles with fingertips while massaging until completely absorbed. May be used several times during the day. 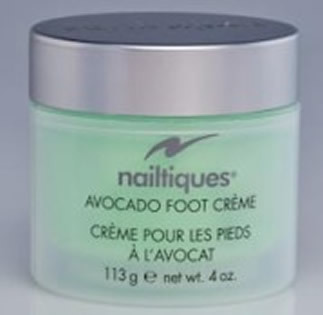 Nailtiques Avocado Foot Crème is a crème rich in avocado oil specifically formulated for feet. Use regularly for maximum benefit. Massage in thoroughly. BEAUTY SECRET: At bedtime, apply the Avocado Foot Crème and put on a pair of socks. Nailtiques Oil Therapy is a delicate blend of vitamin-enriched oils for nails and cuticles. When used over wet polish, the oil can act as a drying agent to help set polish. Apply generously to cuticles and nails. Nailtiques Formula Fix® is a protein based thinner. For best results, add 2-3 drops of Formula Fix® to Nail Protein and/or Color Lacquer as soon as it begins to thicken. Thoroughly blend the ingredients by rolling the bottle upside down between the palms of your hands. Check consistency, the lacquer should drip freely from the brush. This process may be repeated as needed. Use caution not to over-thin as performance may be affected. Nailtiques Non-Acetone Remover is an acetone-free formula to remove nail protein and/or polish. Saturate cotton with remover. Press the cotton over the nail surface for several moments. Stroke over nail until clean. Wash off all traces of remover before applying a base coat. Nailtiques Bite-X® is a nail biting inhibitor with protein. A blend of bitter tasting ingredients with a brush-on applicator. Apply to the entire nail surface and cuticle area. Allow to dry completely. Use daily on bare or polished nails as needed. Keep away from eye area. Nailtiques Anti-Fungal Oil is a combination of plant oils for nails. Clean the nail with soap and water. Allow area to dry thoroughly. The applicator is designed for precise application on the nail and its free edge. Apply twice a day. Nailtiques Cuticle Care Oil blends vitamin and botanical oils for convenient use with a rollerball applicator. Packaged in an easy to use container that is portable for use multiple times a day, if desired. Clean and dry skin and nails. Roll formula onto cuticles. Use fingertips to massage into surrounding skin and cuticles. Nailtiques Acetone Remover is a non-oily formula enriched with tea tree oil, lavender and aloe. A varied option for those who prefer an acetone based remover. Copyright © nailtiques® All Rights Reserved.